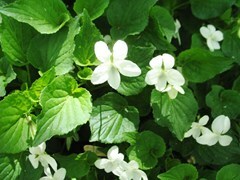 Easily grown in average, medium to wet, well-drained soil in part shade. Prefers humusy, moisture-retentive soils. Spreads by runners to form large carpets in the wild. Viola blanda, commonly known as sweet white violet, is a stoloniferous, stemless, low-growing perennial (1-5" high) which features basal, heart-shaped leaves and fragrant, white flowers with strongly-reflexed upper petals and a purple-veined lower petal. Each flower rests atop its own leafless stalk. Blooms in early spring. Native to moist woods in eastern North America. Specific epithet means mild, pleasant or charming. Mass or group in shaded areas of rock gardens or border fronts. Shade gardens. Ground cover for small spaces. Leave undisturbed and allow it to spread in native plant gardens or naturalized areas.